tests. The stand provides the correct testing pressure as noted in ASTM D-2240, thus eliminating human error. The OS-1 may be used with durometer types A, D, B, C, DO, O, OO and OOO. The OS-2 and OS-4 Operating Stands are a smaller version of the OS-1 stand. 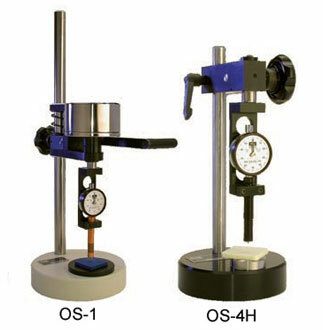 The OS-2 and OS-4 provide a convenient and accurate way to perform repeated hardness tests. All stands provide the correct testing pressure as noted in ASTM D-2240, thus eliminating human error. The OS-2 can be used for type A, B and O, while the OS-4 is for use with types OO and OOO. The OS-2H, OS-3 and OS-4H Operating Stands offer all the features of the standard OS-2 and OS-4 stands, plus a dampening feature. The dampener lowers the durometer at the same rate for each test, resulting in superior repeatability for all durometer tests (especially in the sensitive OO and M durometer types). The OS-2H can be used for durometer types A, B and O. The OS-3 is used only for type M durometers and is ideal for o-ring testing (o-ring fixtures are available). The OS-4H is for use with the OO, OOO and M durometer types. The ORF-1 can be used in conjunction with an OS-3 operating stand and a Rex durometer* to accurately check O-ring hardness. The set consists of five fixtures to check O-Rings with cross-sections of 1/16", 3/32", 1/8", 3/16" and 1/4". Custom and Metric O-Ring fixtures can be special ordered.